Known as SPUD, this is the only high resolution, 24-inch display with an awesome benefit of ultra-portability, it collapses just like a ruggedised umbrella to the size and weight of a paperback book, making it the ideal gadget on the go. When expanded, SPUD uses custom optics combined with the latest DLP technology to produce the sharp, bright image that you need. Either with an HDMI cable or wireless adapter, SPUD can be connected to a smartphone, tablet, or laptop – no matter where you are! From watching movies on the go to being more productive while away from your office, SPUD optimises the visual experience on practically any device. SPUD pops-up to a huge, 24-inch diagonal display. When fully expanded, 61 cm diagonal, 53 cm wide, 28 cm high, 36 cm deep. The 24-inch display is the size of a large desk monitor, with almost 4x more screen area than a 13-inch laptop screen, and 23x more screen area than a 5.1-inch smartphone! 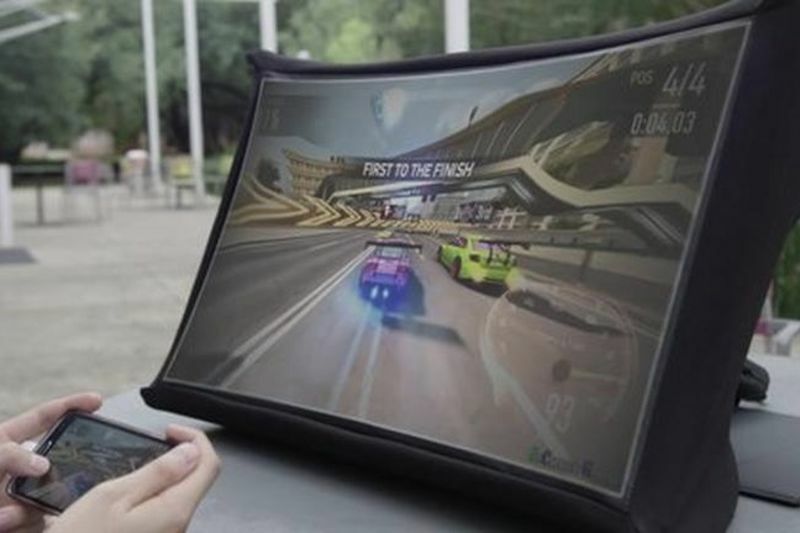 The screen is also highly durable. Unlike breakable glass screens, SPUD uses a flexible polymer that can't get cracked or chipped. Video: Red Explains How Its Magic Holographic Display Works!